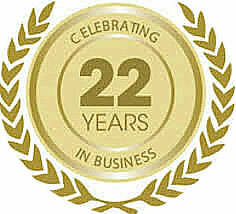 Water filtration is truly a priceless short-term and long-term investment in family health and wellness. Healthy water is undoubtedly the foundation to overall good health and well-being; after all our body is composed of over 70% water. It has been said that we are what we eat; well, we are also what we drink! If you're unable to find what you're looking for on this website, please also visit our newest website at www.vitasalus.com or contact us at 1-877-284-5042 as we provide many other customized specialty systems. If you're not sure about what type of system would best suit your needs, please call us for a FREE Phone Consultation at 1-877-284-5042 or Contact us via email and communicate your specific water condition with one of our Water Filtration/Treatment Specialists. 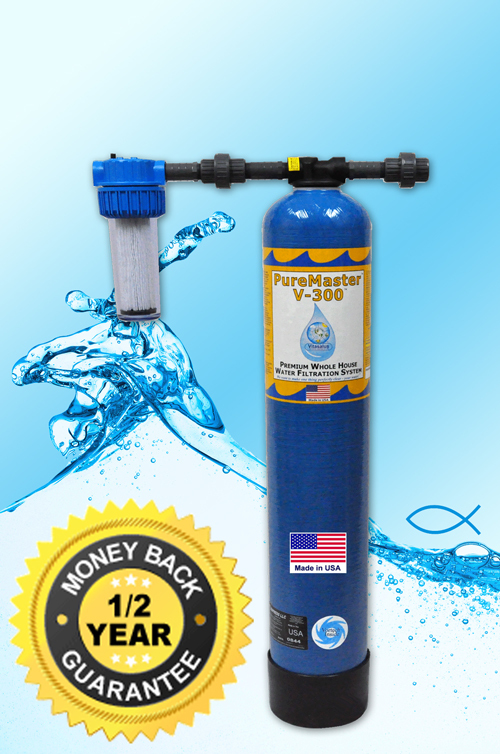 The PureMaster V-300 Premium Whole Home Water Filter System is designed to effectively perform for about 300,000 gallons or 3-5 years for the average household. The PureMaster V-300 may be used for either Residential or Light Commercial applications. The PureMaster V-300 which utilizes 3 advanced water filtration stages is loaded with approx. 30 pounds of NSF® certified high-grade water filtration media developed to effectively filter chlorine, chloramine/chloramines, sediment and/or particulate matter, cysts, copepods, Volatile Organic Compounds (VOCs), Synthetic Organic Compounds (SOCs), THMs (Chlorine by-product), PAHs (Chloramine by-product), atrazine, benzene, xylene, pesticides, insecticides, herbicides, tastes, odors and hundreds of other potential contaminants and harmful chemicals from the water entering your home. 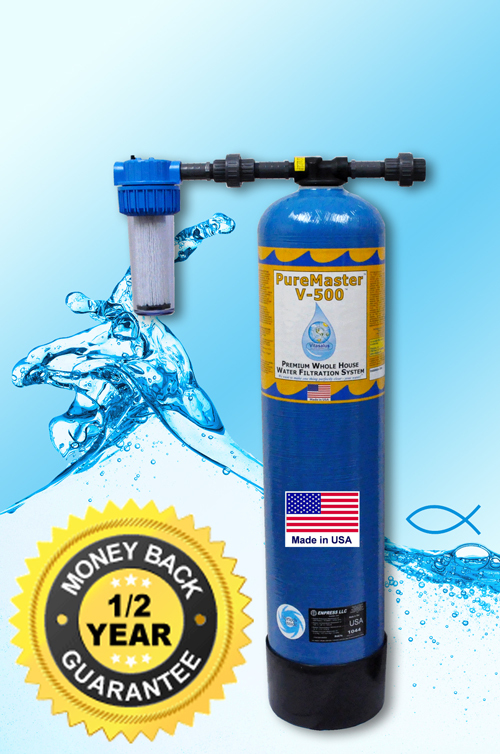 The PureMaster V-500 Premium Whole Home Water Filter System is designed to effectively perform for about 500,000 gallons or 5-7 years for the average household. The PureMaster V-500 may be used for either Residential or Light Commercial applications. The PureMaster V-500 which utilizes 3 advanced water filtration stages is loaded with approx. 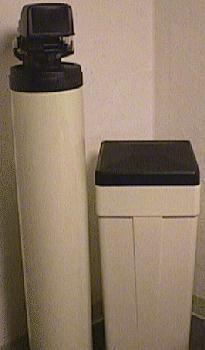 45 pounds of NSF® certified high-grade water filtration media developed to effectively filter chlorine, chloramine/chloramines, sediment and/or particulate matter, cysts, copepods, Volatile Organic Compounds (VOCs), Synthetic Organic Compounds (SOCs), THMs (Chlorine by-product), PAHs (Chloramine by-product), atrazine, benzene, xylene, pesticides, insecticides, herbicides, tastes, odors and hundreds of other potential contaminants and harmful chemicals from the water entering your home. 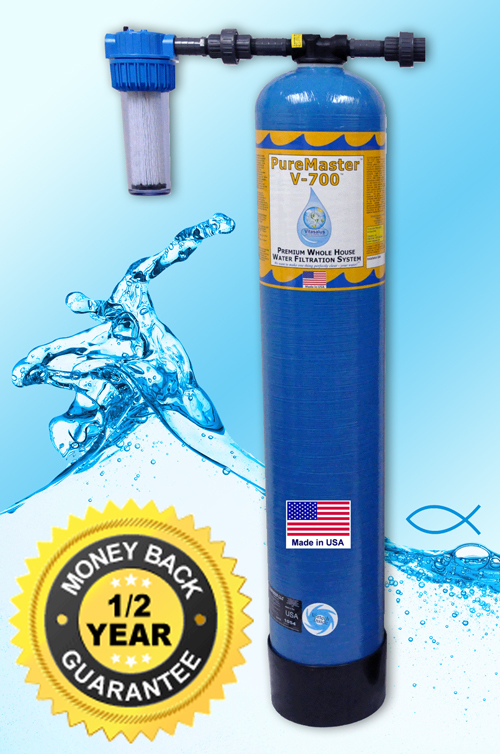 The PureMaster V-700 Premium Whole Home Water Filter System is designed to effectively perform for about 700,000 gallons or 7-10 years for the average household. The PureMaster V-700 may be used for either Residential or Light Commercial applications. 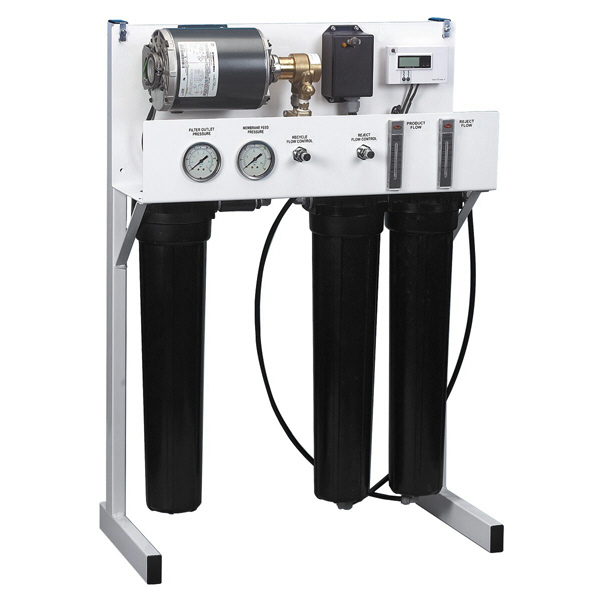 The PureMaster V-700 which utilizes 3 advanced water filtration stages is loaded with approx. 60 pounds of NSF® certified high-grade water filtration media developed to effectively filter chlorine, chloramine/chloramines, sediment and/or particulate matter, cysts, copepods, Volatile Organic Compounds (VOCs), Synthetic Organic Compounds (SOCs), THMs (Chlorine by-product), PAHs (Chloramine by-product), atrazine, benzene, xylene, pesticides, insecticides, herbicides, tastes, odors and hundreds of other potential contaminants and harmful chemicals from the water entering your home. 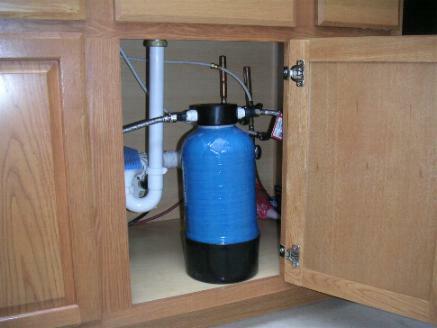 Residential, Light Commercial and Commercial reverse osmosis water purification systems which addresses a broad range of source water contaminants. Our highly-specialized FluorideMaster™ system utilizes high-grade NSF® certified FluoriSorb™ media and is designed to effectively filter fluoride, sediment and particulate matter from all of the water entering your home for 400,000 gallons or 4-6 years for the average household. 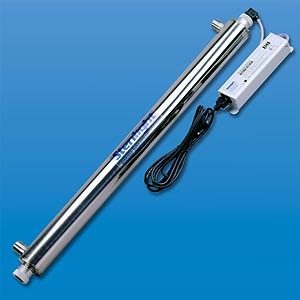 Completely removes or significantly reduces arsenic (type III) and other heavy metals that may be present in your water. For Iron, Manganese and Hydrogen Sulfide (H2S, Rotten-egg Odor). 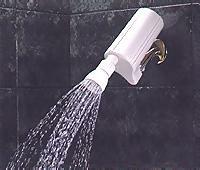 Healthy, eco-friendly, "Green" and easy solution for Hardness, Scale, Calcium, Limescale and Hard Water problems. Utilizes latest MaxConditioningT technology. Simple and very effective! 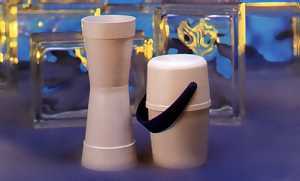 Uses chlorine pellets to handle Disinfection, Iron, Iron Bacteria, Sulfur, and Hydrogen Sulfide (H2S, Rotten-egg Odor). 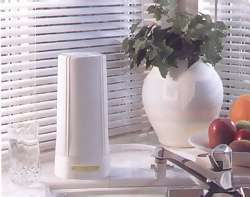 Effectively reduces the pH Alkalinity of alkaline Source Water. Effectively neutralizes the pH of Acidic Source Water. 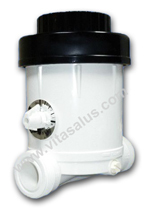 Effective specialty system in combination for Lake, Pond, River, Creek, or Rain source water. Vitasalus offers various well water system packages for the whole house/home to handle well water conditions involving iron, iron bacteria, hydrogen sulfide (aka H2S or rotten egg/sulfur odor), manganese and harmful bacteria. For high levels of Ferric Iron, Sediment, Silt, Turbidity and Particulate. Important Notice: If you currently own or are considering our legacy PureMaster V-750 system, we proudly recommend our more advanced PureMaster V-700 system which supersedes the V-750. The V-700 was designed to outperform the V-750 since it utilizes several times more of the two main workhorse media similarly used in the V-750. Unlike the V-750, since the V-700 requires less manufacturing complexity, you will pay less for your initial system and in the future for your optional replacement media or replacement tank with media. Therefore, the V-700 is the best value system that we offer in terms of performance capability and price. The PureMaster™ V-750 Premium Whole Home Water Filter System is designed to effectively perform for 7 years or 750,000 gallons for the average household. The PureMaster™ V-750 may be used for either Residential or Light Commercial applications. 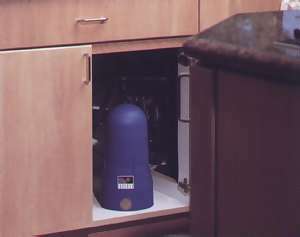 The V-750 which utilizes 7 proprietary, advanced water filtration stages is completely loaded with over 65 pounds of NSF® certified premium-grade water filtration media developed to effectively filter chlorine, chloramine, sediment and/or particulate matter, cysts, copepods, Volatile Organic Compounds (VOCs), Synthetic Organic Compounds (SOCs), THMs (Chlorine by-product), PAHs (Chloramine by-product), atrazine, benzene, xylene, pesticides, insecticides, herbicides, tastes, odors and hundreds of other potential contaminants and harmful chemicals from the water entering your home.